Soothing popsicles for sore throat made easily in a few minutes, with only 2 ingredients! And, they boost your immune system too. This is a sponsored post, all opinions are my own. Every time my kids get a sore throat I have two challenges that lay before me. The first is wondering if they’re even old enough to have cough syrup. A few years back, they changed the “safe” age from 2 to 6. That’s a big difference, and we can begin to feel helpless when our small child is hacking, whining, and choking on their phelgm. Yet, it seems we can do nothing for them. I actually remember when they bumped the age back so far. My friends were shocked and frustrated. But, I was wondering what is in that stuff that isn’t so good for young kids to have anyways? And, that got me investigating natural options. I was thrilled to find Maty’s Healthy Products. 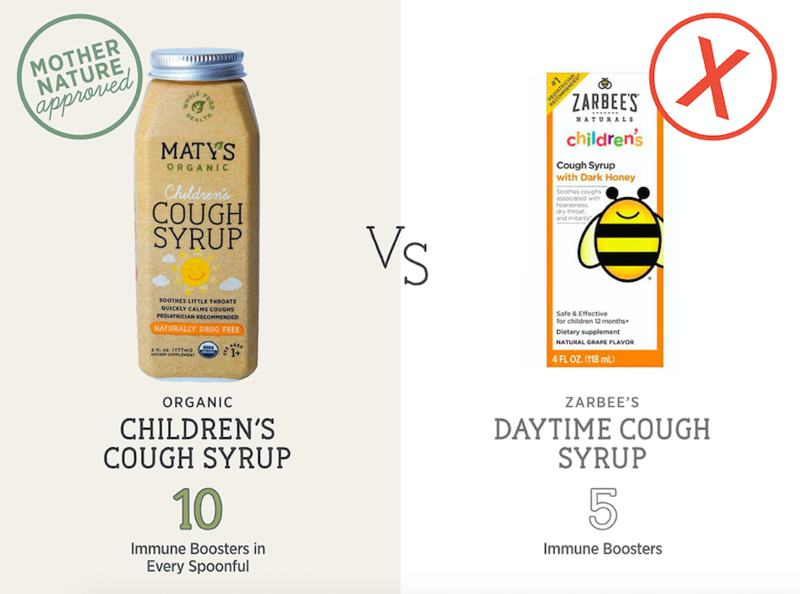 Maty’s fills their three different organic cough syrups with completely natural ingredients and without any artificial colors or preservatives. Even better, their cough syrup can be taken anytime because it’s also immune boosting. And, because it’s all natural, any child 1 or older can safely take it. You’ll recognize every single ingredient, which is why I’m so happy to partner with them again on this post! While Maty’s did solve one of my dilemma’s, and it’s a product I use with my children (and myself), I still had to deal with getting my kids to actual drink it. 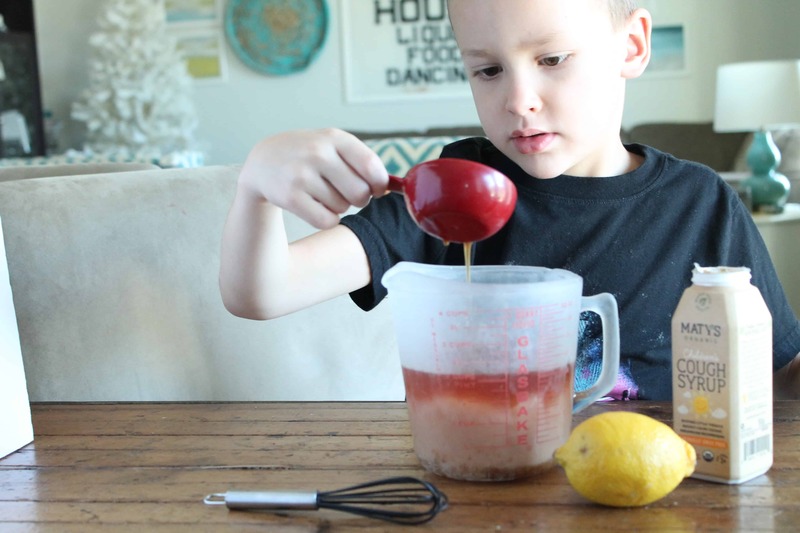 Maty’s cough syrup has a sweet palatable taste, especially compared to other non-natural options, but for two of my kids, it’s still a new food and isn’t what their used to. That is my second challenge. 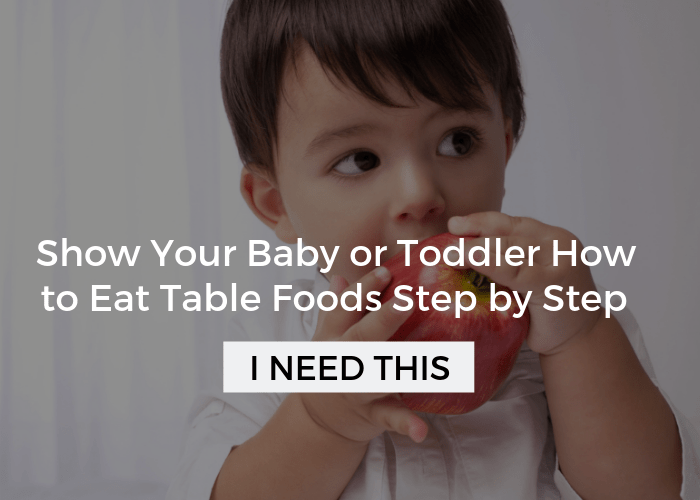 Easily adapted to different tastes and flavors, which can be quite helpful for the many picky eaters among us. Giving them some relief, gives me peace of mind. Instead of feeling helpless, I know I’m not only helping that sore throat, I’m also building their immune system to get rid of that nasty cough. 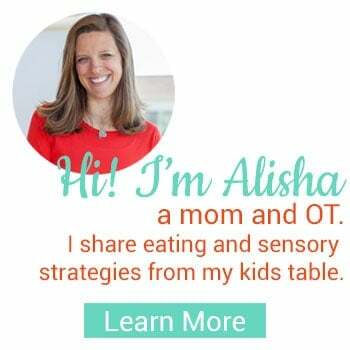 I already hinted that picky eaters may need some more consideration when you’re planning your popsicles. You’ll find in the recipe I’m sharing below that it’s incredibly simple. I’m talking two ingredients with no blender. 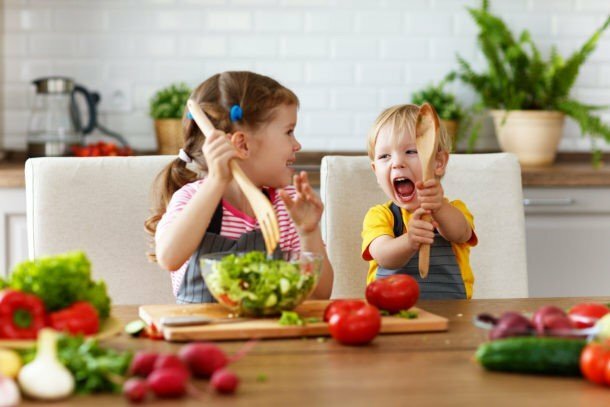 But, it’s also highly adaptable, and if you have an extra five minutes, you can pull out a blender and whip up a drink your child will enjoy that can easily be made into popsicles. See the other options below. If you’re nervous you’re child won’t eat the popsicle after your effort, it’s really important to choose the main liquid as something they enjoy. I used an herbal tea, which is really great for sore throats, but you could also use a natural juice that your child likes, or yogurt, or even ice cream! Start with a really small batch if you aren’t sure. Lastly, if your child is able to, have them help you make the popsicles. They’ll be more willing to eat it if they’ve been a part of the process. 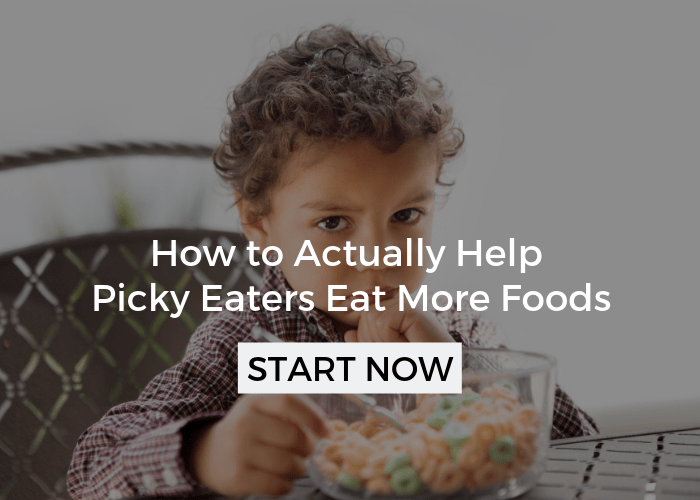 Head over to How to Help Picky Eater’s Take Medicine for more tips. Having a few of these popsicles at the ready in the freezer could help you fight off a budding infection. Or, maybe you know “something is going around”, and you want to try to head it off? 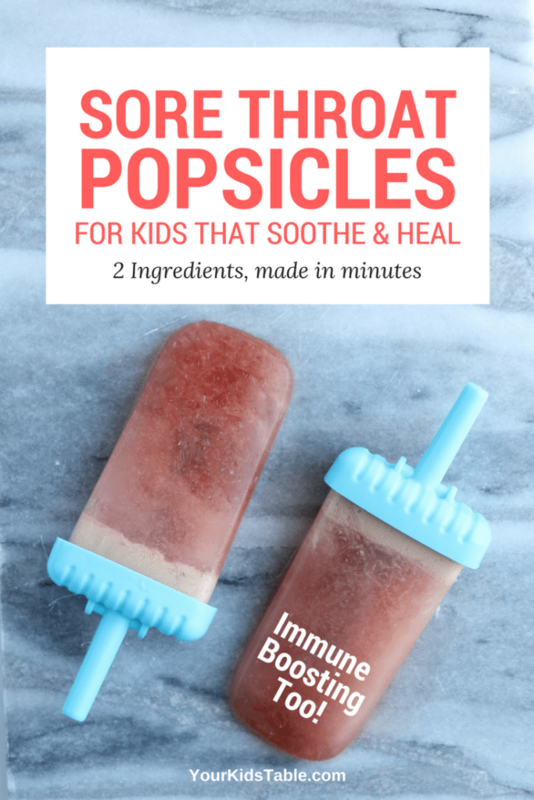 Since these popsicles will actually give a boost to your child’s immune system, you can give them out as needed. For those of you that follow along here, you know that I’m all about easy. Our lives are spilling over with activities and to-do lists. 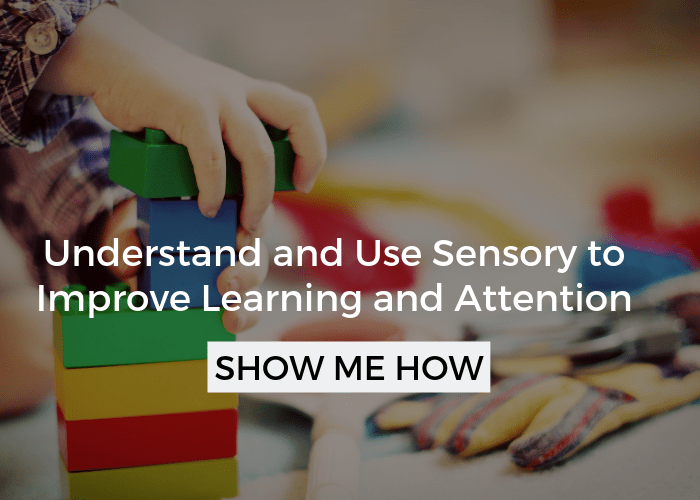 Our kids need a lot of our attention, and there’s not a lot of extra time left for special projects. 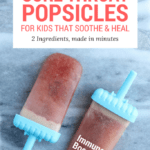 That’s why, after making sure that these popsicles didn’t just feel good to a sore throat and that they helped treat it, my next priority was to keep the recipe incredibly simple. I knew Maty’s would be a key component because they’d already done the hard work of combining the best immune boosting ingredients. I could simply add their cough syrup and be totally covered without adding in 10 additional items. I also wanted a light popsicle that wasn’t heavy for a tummy that might not have much an appetite. I wanted to maximize the liquid I was going to use to also be helpful. And, that’s why the second ingredient is herbal tea. If that sounds strange for a kid, rest-assured its caffeine free and you can easily get some flavors that will really appeal to kids. I make my tea strong so that it has a bold flavor and doesn’t taste watery. 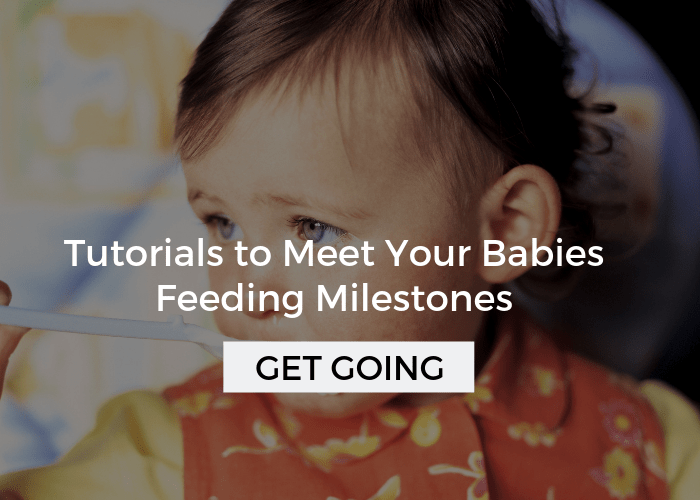 You can adjust accordingly if you think your child would prefer something different. I choose a harvest blend tea that’s basically apple and chamomille flavored. Other teas that would also work well are peppermint, lemon, ginger, or chamomille. I took 2 tea bags and 2 cups of hot water, and I microwaved them for 4 minutes (you can also bring water to a boil on the stove). And then I let the two tea bags steep in the hot water for 10 minutes. After that, my son poured in 1/3 cup of maty’s original cough syrup and we whisked it together. 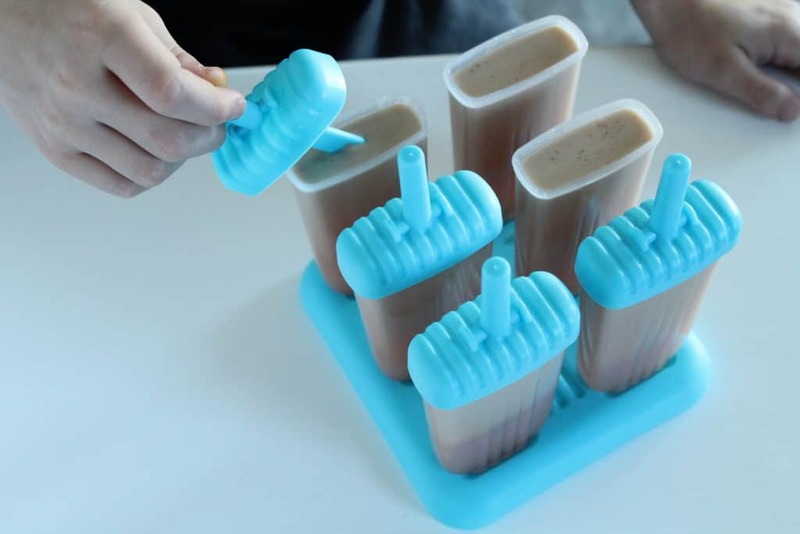 We quickly poured the liquid into my favorite popsicle molds and set them in the freezer. It’s important to do this step fast because it will start to separate. If you’d like, you could also add fresh or frozen cherries, berries, mango, or oranges. 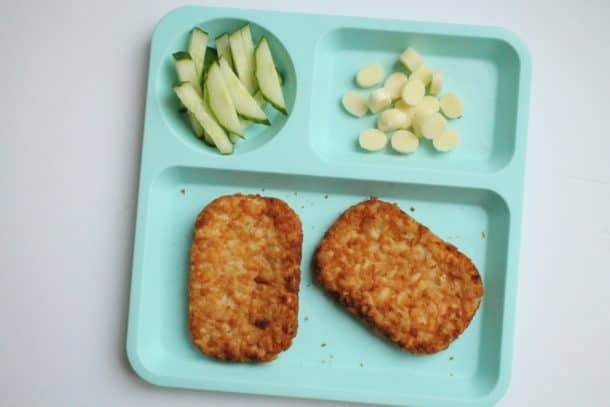 If you do add some fruit, it would be best to puree the whole mixture with a blender or food processor before adding it to the popsicle molds, as chunks of food and even chewing can be turn off for kids with sore throats. Only a few minutes to pull together and 3-4 hours to set in the freezer! Steep herbal tea of choice for 10 minutes. Mix in cough syrup or honey with a whisk or blender. If desired use a blender or food processor to mix in frozen fruit. Pour in popsicle mold and place in freezer for 3 to 4 hours until frozen. This recipe is extremely adaptable. 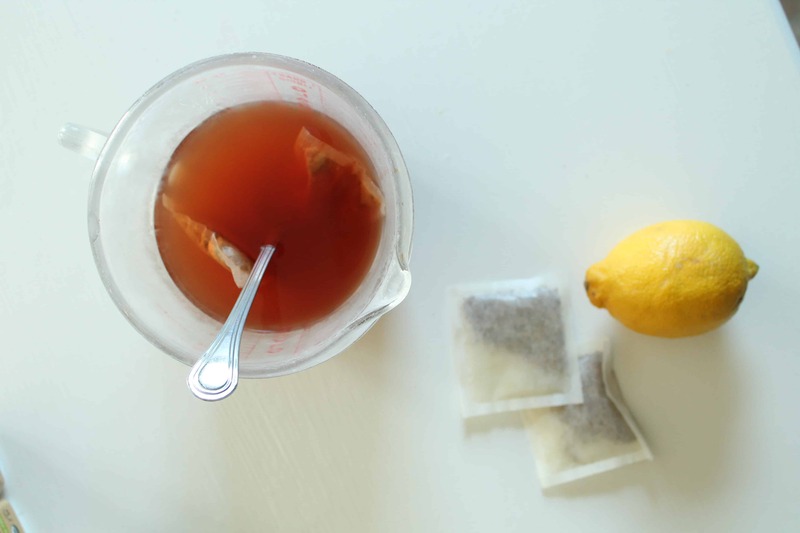 You could substitute the tea for juice, sparking water, yogurt, or even ice cream. For more ideas on how to soothe your child’s cold naturally, check here. If you want to learn more about Maty’s, you can head to their website here. And, you can snag your own bottle on Amazon here. Pin this to your recipe board so you can find it again when you need it! I am totally going to try this recipe with honey chamomile tea! I’ve never use tea in a popsicle. Thanks for the tip.